The outer cells that grow out of the epidermal collar cornify and form the feather sheath that will disappear soon after the feather emerges. Cells in the intermediate layer start to line up into barb ridges. In pennaceous feathers such as contour feathers, barb ridges first appear at the middorsal part in the zone of differentiation (the ramogenic zone) and grow down helically around the pulp to fuse at the opposite site to form the rachis. In plumulaceous feathers such as down feathers, barb ridges grow straight down and only form a short rachis at the base. In this stage, the basilar cells rearrange themselves around the sides of the barb ridges, become flattened and form marginal plates. See next picture. 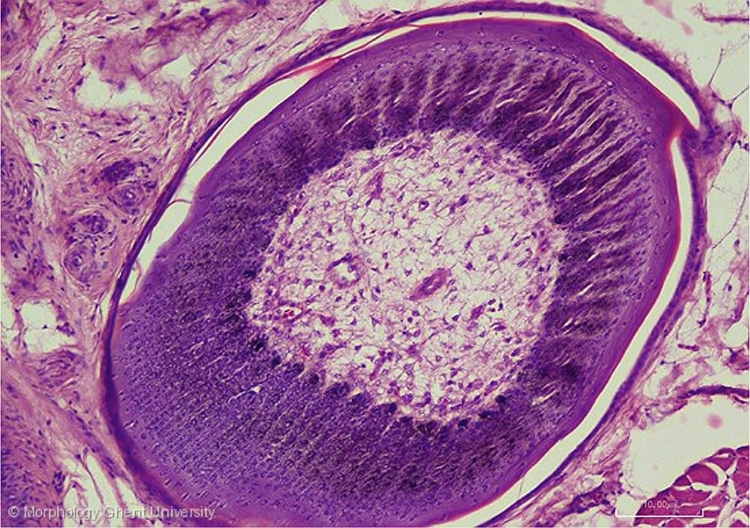 The micrograph above is a truly cross section, not an oblique section so the ridges at the dorsal side are further developed than those at the ventral side.